In a single day, how many times do you estimate you say “just a minute” to someone (often a child)? Honestly, I feel like I say it ALL THE TIME! It’s just a habit for me when they ask for a snack, for me to help them with their socks, for me to get the glue stick they can’t reach in the back of the drawer, for me to open the garage door, for me to refill their water bottle, etc. etc. If you have “just a minute” (or ten minutes) of time in between appointments, while you wait for water to boil, or when your kids are playing with the neighbors, see if you can quickly tackle one or more of the tasks below. I realize each task individually will not drastically improve the state of your home or instantly simplify your life… BUT OVER TIME, you will not only declutter, better organize, simplify, and clean your home, you’ll also develop the habits of utilizing your time efficiently and always looking to better your spaces (2 invaluable habits in my opinion). 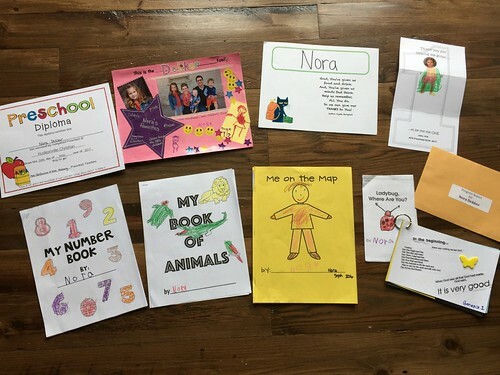 No, you won’t completely eliminate all paper clutter from your home in just 10 minutes, but you might be surprised how much “damage” you can do to some of those piles! 1. Make your to-do list for the day! 3. Remove old artwork and drawings from your refrigerator to make room for new projects (I take a picture of the artwork and recycle the drawings… I rarely save the actual papers). 4. Recycle magazines older than 1 year and newspapers older than 1 week. 5. Purge your cookbooks; only keep the ones you really love and use. 6. Weed through your recipe box and toss the ones you know you’ll never make (or that you can easily find online). 7. Work through SOME of the paper piles on your kitchen counter or in your office. 8. Grab a pad of paper and test pens and markers. Toss any pens/markers that don’t work, and set pencils aside if they need to be sharpened. 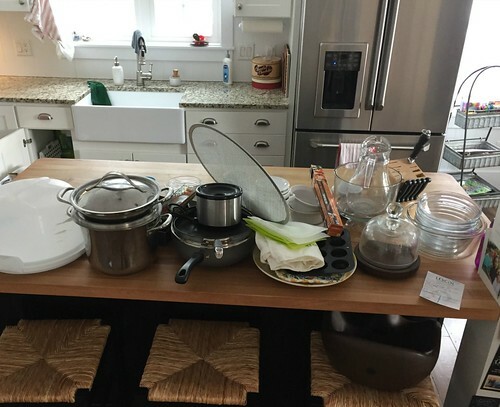 There are SOOOOOOO many quick decluttering projects you can do in the kitchen — I like to do them while I’m waiting for water to boil, waiting for the oven to preheat, or waiting for my kids to finish their meal. 9. Purge expired or stale foods from your pantry. 10. Purge anything past its prime in your refrigerator. 11. Weed through your freezer and make a plan to use up food that has been sitting around for a while. 12. Create your menu plan for the week (or at least a few days). 13. Make a grocery list. 14. Clean out the dishwasher (and load it again, if necessary). 15. Clean food spills on your stove top. 16. 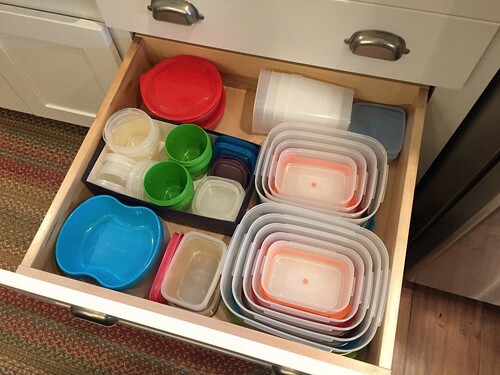 Reorganize food storage containers — purging any lids without containers or any containers without lids. 17. Wipe down the fronts of your appliances. 18. Wipe out produce drawers and evaluate what produce you should use first. 19. Wipe out the silverware drawer and remove anything that shouldn’t “live” in that drawer. 20. Purge old water bottles, plastic souvenir cups, extra straws, can cozies, or other beverage items you no longer need. 21. Sort through your junk drawer. As I’ve mentioned before, I keep paper grocery bags or large diaper boxes in most of our closets as the destination for items that no longer fit, or anything we don’t wear. This saves lots of time decluttering later! 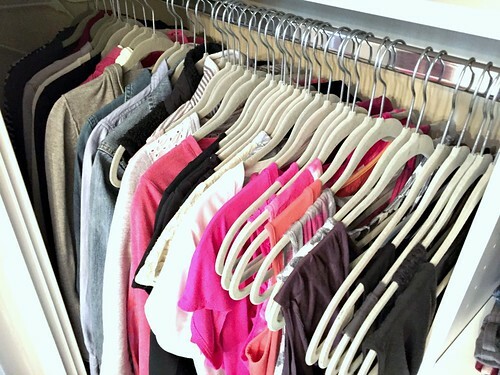 Here are a few other ways you can pare down your clothes clutter in less than 10 minutes! 22. Take a donation bag into your bedroom and load it up with anything you know you won’t wear (just do as much as you can in 10 minutes). 23. Repeat this with all the other closets in your home — seriously, you’ll be amazed at how much you can purge in 10-minute intervals! 24. Straighten the shoes and boots in your mudroom or entryway. 25. Toss out mis-matched and/or lone socks. 26. 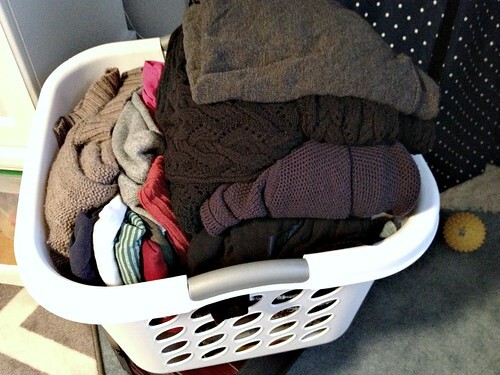 Fold a load of laundry AND put it away! 27. 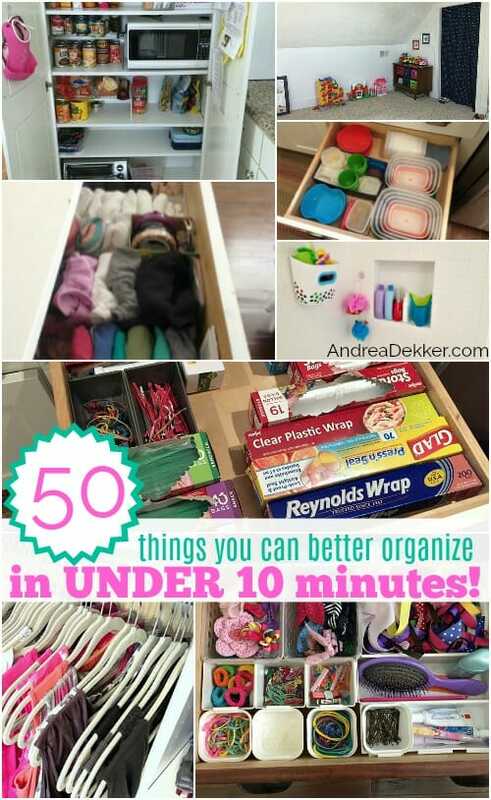 Reorganize one drawer in your dresser (or a child’s dresser). 28. Swap out seasonal clothing (if you’re the type who changes your closet around for different seasons). 29. Clean out your purse/wallet/diaper bag. 30. Restock purse/wallet/diaper bag if necessary. I consider the living areas to be anywhere I can easily see when I walk into the house (kitchen, dining room, living room, office). I like these spaces to be relatively clutter-free so I’m not staring at clutter and mess all day long. Yes, they get messy EVERY day… but we also diligently put them back to “normal” again every day (usually before lunch, before dinner, and before bed). It makes such a big difference in the over-all feel of our home — and it’s so nice to wake up to a clean house every morning! 31. Fold all blankets, put them away, and place pillows back on furniture (this makes such a big difference). 32. Bring all dirty dishes to the kitchen and load dishwasher. 33. Put all books, movies, magazines, and newspapers away. 34. Put toys and games away. 35. Fill a bag, box, or laundry basket with anything that doesn’t belong in your living spaces (you can put the items away later… just get the space decluttered for now). 36. 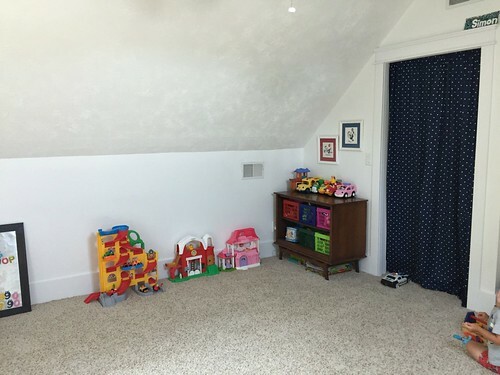 Dust one room and straighten the flat surfaces as you dust. 37. Vacuum or sweep one (or 2) room(s). 39. Empty all trash and put new bags in waste baskets. This is one of the hardest areas for me — mainly because I don’t regularly spend all that much time in the bathroom, so I never think to just “hang out” for 10 minutes and purge! I often tackle various areas of the kids’ bathroom when they are taking a bath at night — that seems to work well for me right now! 40. Toss expired medication and first aid items. 41. Make note of any prescriptions, over-the-counter meds, and other first aid items you need to stock up on again. 42. Purge any makeup or cosmetic item you no longer want or use. 43. Wash your makeup brushes. 44. Remove hair from your hairbrush, purge combs and brushes you no longer want, and wash the rest using this simple technique. 45. Weed through hair accessories. 46. 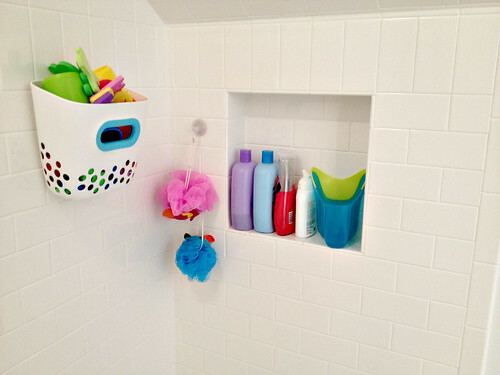 Toss empty bottles and combine like items in your shower. 47. 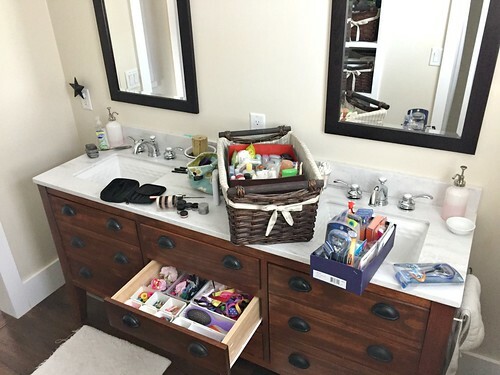 Clear off counters and put items away (or make a home for them to be put away). 48. Hang all towels and change out hand towels and wash cloths (this is one of the first things I do every morning for our bathrooms and kitchen). 49. Wipe down the counter, sink area, and toilet with a sanitizing wipe. 50. Wipe down the mirror(s). The point is, there are countless tasks you can do to clean, organize, and simplify your home and life in just a few minutes. You don’t need huge chunks of time, you don’t need to hire a babysitter, you don’t need to give up all the other fun activities you want to do each day — you just need to make a conscious effort to continually and diligently tackle a couple of these quick tasks with the few extra minutes you have throughout the day. The next time you say “just a minute” to a child, a friend, the person on the phone etc. remind yourself of ALL the things you can actually do with “just a minute or 10” of spare time! Love this! Thank you for sharing, Andrea! I hope to consciously and intentionally do this every single day. Wish me luck, haha! Good Luck Joy — you can do it! I love this! Thank you! I am trying to be more productive by getting up 30 minutes earlier during the week. This is a great list to use to get things done. awesome! I think you’ll be surprised what you can do in that 30 minutes! yes for sure! If the whole family pitches in, you’ll accomplish so much more! I like your comment on the end. A lot of times I check my phone and end up reading something for 10 minutes. Then I think, oh, I don’t have 3 minutes to clean the bathroom right now. That sounds stressful! But what I really mean is, I don’t WANT to clean the bathroom right now! 😉 And, a clean bathroom and less visual clutter will make me feel so much less stressed when I legitimately don’t have the time. This is a constant internal struggle for me. yeah, we’re all guilty of that at times! You are not alone!! This is great!!! Tonight I plan to implement your timer method to get some stuff done. I often do mini decluttering or prepping projects while I’m waiting for food to finish. Great ideas!!! Also, Andrea, do you out the pictures you take of their artwork in their monthly pages in their photo books you make them. Or do you do something else? Curious for ideas!!!! I am not a hoarder, but I find myself having a hard time letting go their artwork unless I give it to people. Haha! I don’t have a specific way I handle it all the time — basically whatever I’m in the mood for. Many times, I just trash everything because I’m so tired of paper piles. Other times, I’ll take pictures of everything or even pictures of them standing next to the magnet board with all their artwork. Then I’ll put those pictures in their photo books — but lots of artworks just gets tossed! good luck and happy organizing! !